Dave has been a part of Eastco’s family since 1995. Throughout his life, he has been challenged by health problems. He is legally blind and maintains mobility through the use of an electric wheelchair and the use of one hand. When Dave arrived at Eastco, he was afraid of failure and became anxious when introduced to new skills. The staff was told that Dave would not be able to do much. With the assistance of Eastco job coaches, however, Dave was introduced to new skills in an environment where he felt comfortable. He quickly gained confidence in his achievements. Today, Dave can perform any job presented to him. Today you can find Dave at Eastco’s Service for Business facility adhering labels to knee pad packages. Challenge, which he once feared, has become his friend. He has a true passion for work, learning new tasks, and participating in life. 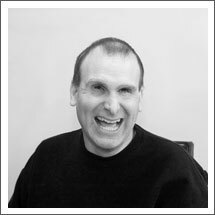 Dave’s constant smile is contagious to the staff and his peers at Eastco. He brings great joy to us all. Frannie had a tough start in life, she was born in an institution. After meeting Eastco founder Barbara Place and coming to Eastco, she was given a new beginning. Frannie was among the first individuals to be released from the state institution and given the chance to live in a community. 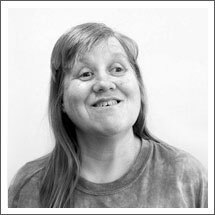 Frannie soon had a home, job and a caring community around her. 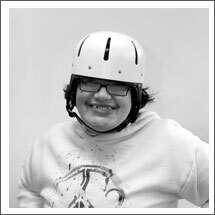 Her drive and determination allowed her to move from a residential home into her current supported-living apartment. Frannie beams when anyone visits her apartment. She loves having her own home and living a life indistinguishable from those around her, something she always dreamed of. Eastco provides the support that helped her realize her dream a place to call her own. The work and social skills learned at Eastco gives her the confidence to have jobs alongside nondisabled workers in local businesses, including Burgerville, where she holds the record for longevity. Her days consist of working two jobs, using public transportation to move around the community. David is a native and staple to Gresham. Throughout childhood and early adulthood, society focused on David’s disability instead of his abilities. His mother wanted more for David. In 1983, David began work in Eastco’s production area. Upon mastering the skills used there, David expressed interest in learning more about Eastco’s screen imprint shop, Eastco Screen Imprints (ESI), which had just opened. David began working at ESI in 1985 and has been there ever since. He is now the Head Screen Printer. David works Monday through Friday, three to six hours per day. “Unable and limited” are not part of his vocabulary. David’s success can be attributed to his talent, his tenacity and the opportunity to flourish in a positive work environment. 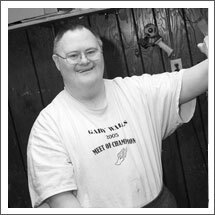 His abilities have shaped his life at Eastco and in his community. Jeff came to Eastco to benefit from the array of employment opportunities we offer, along with an assortment of recreational and educational activities. Once a part of the Eastco family, Jeff began working with a janitorial crew at the Bagdad Theatre. He is curious about everything and loves to learn. When the theater contract ended, he went straight to work in Eastco’s production area, where he learned a wide variety of skills. 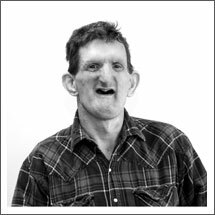 Due to health issues, Jeff has retired from the Eastco Employment Program but continues to participate in our Life Enhancement Activity Program. Skill-building activities, such as dialing 911, are an integral part of these programs. In the fall of 2009, when Jeff’s brother was visiting, their mother collapsed in the bathroom. While his brother was assisting their mother, Jeff dialed 911 and asked for help. He remained calm and provided all of the information the emergency team needed. Jeff’s mother loves to share this story, and we couldn’t be more proud of him. 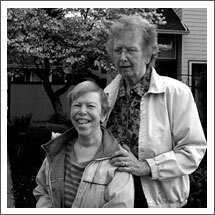 Claudia’s life was enriched in countless ways thanks to the foundation laid by her mother, Barbara Place, who founded Eastco. Her life is full and stimulating, filled with activities that allows everyone to experience the normal flow of life, home, family, friends, work, recreation and retirement. Through services from Eastco, Claudia has friends to hang with, learns daily life skills, earns a paycheck and takes pride in her accomplishments. She is an integral part of her community.